APQC’s research shows that KM is among the top four functional areas targeted for automation (right after finance, process management, and customer service.) The top KM projects include enhancing collaboration through bots programmed to answer FAQ’s and make recommendations and content management and tagging, all of which enhance search. Given the rapid pace of AI experimentation, KM’s role and skills need to change. Fortunately, the “Digital Organization” needs exactly the skills that KM is perfectly suited and situated to provide. These are some of the uniquely human (at least for the moment) skillsets that KM teams will need to thrive in the future as machines automate routine tasks. Partnering skills—KM teams need good facilitation, listening, and engagement skills to collaborate with the business unit’s diverse partners across the organization (without this, nothing else matters). 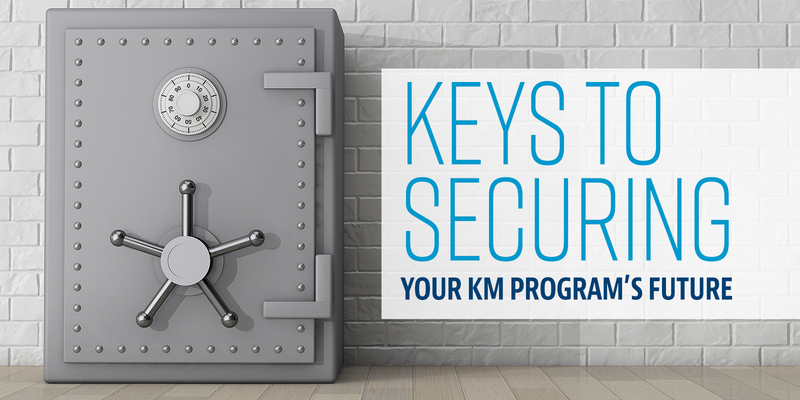 Technical savvy—KM teams don’t need to be able to do the programming, but they need someone who is familiar with the language of technology, keeps up with the trends, and understands the potential technology solutions . Innovation skills—KM teams should stay on the forefront of design thinking, agile thinking, systems thinking, and similar methodologies . Change management skills—KM must help end users and other internal partners handle rapidly evolving processes, methodologies, and technologies. Join the digital transformation strategy. KM exists to support the organization’s collective learning and avoid corporate amnesia. As such, its participation can help ensure the success of internal digital transformation efforts, which are currently attracting huge investments and leadership attention. Experiment alongside partners. The most successful programs are sponsored by internal alliances. Digital transformation and AI are opportunities for KM to bootstrap budgets and to learn in a safe way with your partners. Understand the processes you support. You cannot support something with knowledge if you don’t know the business processes and where knowledge is needed. Use knowledge mapping techniques to understand how knowledge flows through business processes, while recognizing that flows may change as processes are automated. Bring legal and risk in early. Remember that people help support what they help create. If KM leaders engage legal and risk functions early, they can keep KM out of trouble while motivating legal and risk partners to help implement new capabilities within established risk parameters. Future-proof yourself and your team. Teams need expertise in design thinking, change management, and similar disciplines in order to facilitate and participate in better conversations across the organization. Now is the time for KM to get in on the ground floor of digital transformation and become an indispensable partner in creating the future. Keep enhancing your uniquely human skills of empathy, insight, resilience, and collaboration, as well as your deep knowledge of the way the world and your organization works. Unlike most AI programs designed to do one task exquisitely well, your agile human skills are portable to most any occasion. They will pay off now as well as offer some job protection in the future.